If you are a new dog owner, it can be a little overwhelming trying to figure out how to best care for your new pet. Whether you have just adopted a new puppy, or if you’re integrating an older rescue dog into your family, both of them need to be walked on a regular basis. However, how often your dog needs to be walked is based on several factors. These factors include your dog’s age, breed, size, health, and diet. Dogs need some form of exercise every day to keep them healthy and to prevent them from getting bored. This can be hard to do if you have a full-time job or other commitments that require you to leave your dog alone. Whether this is long work days, or if you are taking a weekend trip, you need to have a plan for who is going to walk your dog in your absence. The best solution to this problem is to hire a professional dog walking company. They are trained in how to walk dogs and how to take care of them, so you know you are trusting your beloved pet with the right dog sitting company. Without daily physical activity, your dog will become bored, frustrated, and unhealthy. Exercise helps tone the muscles of your dog, keeps their body and metabolic systems in top shape to function properly, and it engages their mind. If your dog is exhibiting some destructive behaviors like chewing furniture or excessive barking, the problem may be as simple as boredom. If you begin to implement physical activity in their everyday lives, this will provide them with mental stimulation (and tire them out) and you might find a dramatic decrease in these unwanted behaviors. Just like humans, dogs can also struggle with weight gain and obesity if they are not burning off more calories than they take in every day. Complications relating to weight are unfortunately a problem for many dogs. Plenty of exercises will make sure that your dog stays in good shape and is as healthy as possible. If you notice your dog gaining a little weight, increase the length and number of your walks. 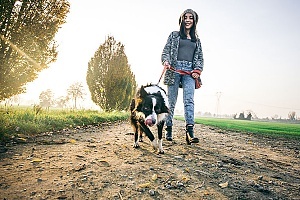 While you need to look into your dog’s specific breed, size and overall health to know exactly how much dog walking they need a day, 30 minutes to two hours a day is a general rule of thumb. If you have a hunting, working, or herding dog (like Labrador retrievers, hounds, collies and shepherds) you will find that your dog is in need of longer and more rigorous exercise. On the other hand, if you have a short-nosed breed dog (like a Bulldog), your dog will not need a lot of daily exercises. Casual dog walking around the neighborhood once a day will be sufficient exercise for them. If you have a dog of mixed heritage, you will probably discover that it’s harder to find specific information pertaining to your dog. If this is the case for your dog, you need to focus more on the dog’s age and the signals they are giving you. Younger dogs are going to be walked significantly more than older dogs to keep them healthy and mentally engaged. As dogs get older, they will be less active and may even have conditions that are slowing them down. However, even if this is because they are too heavy, have achy joints and muscles, or have become lazy, they still need to be taken for short walks. Focusing on the signals your dog is giving you is a great way to determine how often they need to be walked. If your dog is restless or pacing a lot, you should increase the number of walks you’re giving them. If your dog seems exhausted and is sleeping a lot, perhaps you should decrease the number of walks. You want to find a healthy balance. When raising a puppy it’s very important to know that they require much less exercise than a full-grown dog. In fact, over-exercising them can lead to developmental damages in their joints, which could cause early-arthritis. A good guide to follow is to follow the ratio of five-minute walks per month of age of your puppy until they are fully grown. These walks should happen up to twice a day, and shouldn’t be spaced too closely together. When your puppy reaches three months old, you can increase your walks to about 20 minutes. Once they are fully grown, focusing on their breed can offer you more insight into how often they should be walked. Where you live can also affect how often you need to walk your dog. If you live in an apartment and don’t have a lot of space for your dog to explore and play in, you should be taking them on many more walks throughout the day. If walking your dog is the primary way they are able to relieve themselves, then they should be a give a lot of short, frequent walks. At least once a day, a walk should be longer to allow them time away from their living space to explore new areas and enjoy being outside. If you live in a house with a large backyard, you will find that the opposite is true. Your dog will probably need less walks if they have a wide open space they can run around and play in. While this can decrease the number of walks you take them on a day, it shouldn’t be a substitute for dog walking. When your dog is enjoying themselves in your backyard, there is no way to control the amount of exercise they are getting. 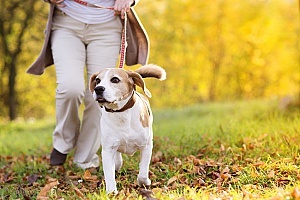 Taking them on walks will ensure that they are getting the appropriate amount of exercise every day. Plus, walks are a great way to spend quality time with them. If you are unable to keep up with the number of walks your dog needs a day, don’t hesitate to hire a professional dog walking company. They can be especially helpful and can assist with dog sitting when you find yourself having to go out of town. They can even help advise you on how many walks a day are appropriate for your dog.